To easily download photos from iPhone to iMac, you can rely on a full-featured photo transfer app named MacX MediaTrans. It provides iOS users with the simplest solution to import photos from iPhone to iMac at an alarming rate and no quality loss. Many iPhone users constantly complain that there is no enough storage available to take another photo, download another app or prepare for the upgrade because of a huge photo library. Thus, they have to find out a proper iPhone photo transfer to download photos from iPhone to iMac without using iCloud or iTunes. 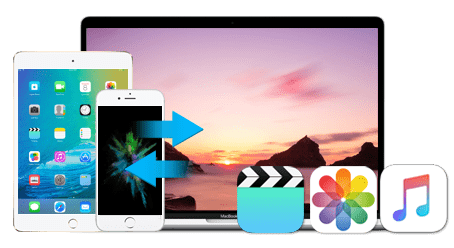 MacX MediaTrans, top iPhone photo manager software, is powerful to help you bulk transfer live photos, HD/4K pictures, heic photos, jpg images from iPhone X/8/Plus/7/6s/6 to iMac 5K/4K or iMac Pro at No.1 fast speed. Better still, it can automatically convert heic to jpg during the picture sync. Thus, you can play heic photos on Windows, Android or Microsoft device without trouble. As is known to all, the free storage space on iCloud is limited (The maximum file size is 5GB.) and you should pay a premium for more storage space. Obiviously, it is unrealistic to expect to free store various iPhone HD or 4K photos on iCloud. And iTunes doesn't support transferring photos from iPhone to iMac or MacBook. In order to successfully download pictures from iPhone to iMac, you should depend on MacX MediaTrans. This is a propessional iPhone photo backup program which can painlessly copy photos from iPhone to iMac so that you can back them up or edit photos on Mac (macOS High Sierra included). That's not the whole story. It can also transfer photos to iPhone 8/Plus/7/6s/6/5s and bulk delete iPhone photos to better organize your photo library. Before getting photos from iPhone to iMac, you should download photo transfer for iPhone on your iMac 4K/5K. Step 1: Launch this iPhone photo transfer on your iMac 4K/5K and link your iPhone to it with a USB. BTW. It is compatible with iPhone X/8/Plus/7/6s/6/SE/5s/5 running iOS 11 or earlier. Step 2: Click "Photo Transfer" button on the main interface of photo transfer from iPhone to iMac. Here you can choose your desired photos from Camera Roll, Photo Stream, Photo Library, Photo Share, Albums, etc. Tips: Take Camera Roll as an example for transferring picture from iPhone to iMac. Tap on Camera Roll, and select the photos you want to transfer to iMac. BTW, two different view modes are available: Thumbnail and List view modes. Step 3: Click the "Export" button on the top or simply do this by drag and drop. Seconds later, you can get your photos off iPhone X/8/7/6s/6/SE/5s to iMac in high quality. 1. Besides transferring photos from iPhone to iMac, this iPhone photo transfer also can: freely add and edit photo albums, delete multiple photos from Camera Roll at once; move photos from iPad/iPod to Mac computer (iMac 4K/5K and MacBook Air/Pro), copy photos from Mac to iPhone iPad iPod. 2. Tranferring music/video/movies from iPhone/iPad/iPod to Mac and vice versa are perfectly supported by MacX MediaTrans. Though there are lots of iPhone file manager apps on the market, the aforementioned fastest and most efficient iPhone photo manager ever made for Mac is absolutely worth to try. Because it is able to be used to mount iPhone as flash drive for storing all kinds of files including music, videos, photos, Word, Excel files and more. First-rate iPhone photo transfer tool enables you to painlessly download and sync photos from iPhone to iMac and transfer music, video, ebooks, ringtones, iTunes purchases, etc from iPhone to iMac in batch, as well. With it, you can free play heic on Windows, Android thanks to its heic to jpg conversion ability. 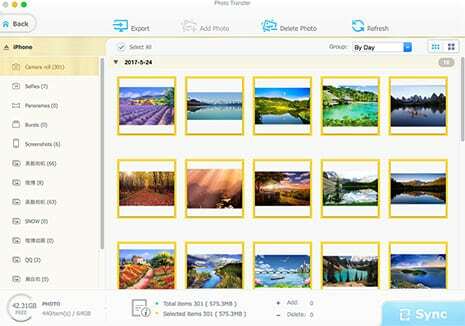 Best photo organizing software for iPhone iPad.